Guitar lessons for Acoustic, Electric and Bass guitar are available in group classes and private tuition. Group classes are fun and sociable, acquiring confidence and social skills as the group progresses together. Private tution are for those who would prefer individual attention and focus on specific needs. We teach many musical genres from folk, blues, rock and jazz. 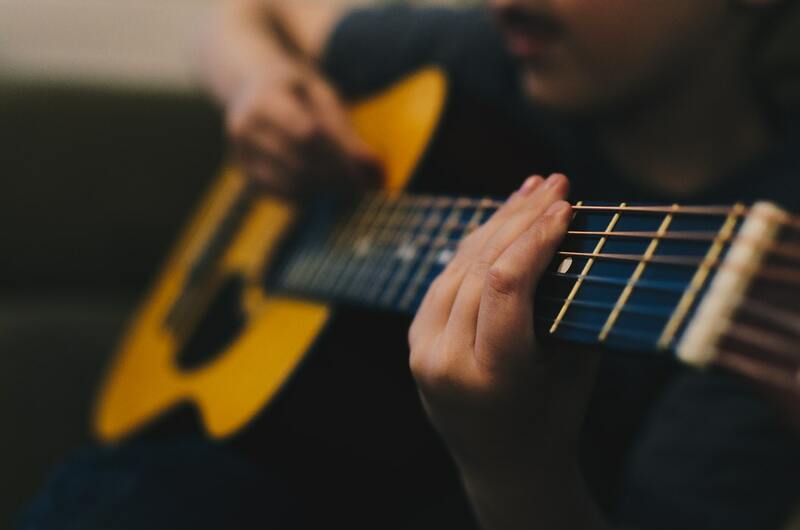 With our team of young guitar teachers who have a vast experience in both live performance and studio production, students will be taught all aspects of playing the guitar. Guitars are a popular, versatile and one of the few easily portable musical instruments. The Acoustic Guitar has six strings and a fretted fingerboard. It comes in nylon strings which is the softest and easiest for younger students and steel strings which are a made thicker and tougher. The Electric Guitar has six strings, fretted fingerboard and connects to an amplifier. It is usually made up of steel strings and therefore it is recommendend for young beginners to start on an acoustic guitar. The Bass Guitar is an electric version of the double bass. It is electronically amplified like the electric guitar. It is a single note instrument that rarely plays chords. The bass consists of four strings and is often considered easier to learn than the six string guitar.